Concrete Revolutio Episode 2: An Almost Linear Plot! Wow! Inside the ‘Black Fog,’ the second episode of Concrete Revolutio, featured a plot that almost had a conventional structure! The story begins by introducing Fuurouta. We saw only briefly in the last episode when he and Kikko Hoshino confronted Jirou Hitoyoshi in the future timeline. In episode 2, he frees a huge and beautiful unicorn beetle just in time for a black fog to obscure the sun. The shapes in the fog terrify him, but the unicorn beetle, now glowing, thanks him for saving her and departs. 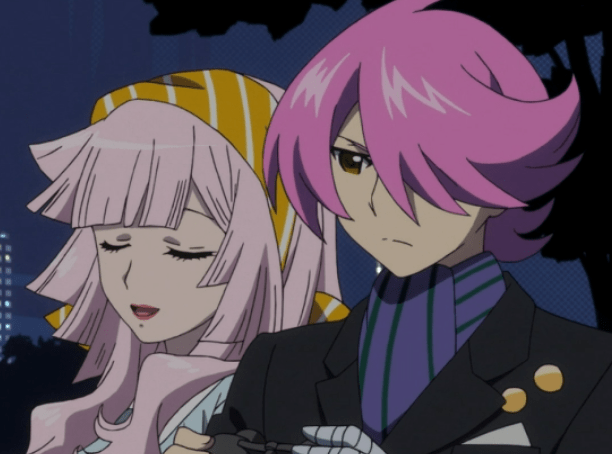 Continuing Concrete Revolutio’s penchant for dual timelines, the plot jumps ahead. Jirou and Kikko go on a mission to foil Fuurouta’s escape from jail (not sure why he was in there!). She needs to use her magic on him because as a ghost, he can pass through inanimate objects. After bringing him back to the Superhuman Bureau, Fuurouta makes it clear that he wants to join so they can go fight the Tartaros Bugmen, who Fuurouta says are behind the Black Fog. Shortly thereafter, the Black Fog envelopes the National Diet with the Prime Minister. The Bureau dispatches Jirou and Emi Kino to investigate. The Black Fog begins to retreat, and they find unconscious superhumans who were part of the defense force — thus making the Black Fog their problem now, since the Bureau’s job is to protect superhumans. Fuurouta meets Campe on his way to Jirou’s house. Capture from the Funimation stream. Fuurouta runs into Campe, a young woman with bug features. She asks him to be her friend. Nothing more; just friends. He agrees as quickly as he leaves her standing in the street. Having read Jirou’s address from Kikko’s address book, Fuurouta flies there to find Daishi Akita and Professor Magotake Hitoyoshi, Jirou’s adopted father, as they discuss a Bugman destroying biological weapon the Professor had found on one of his journeys. The Professor told the story of how giant insects once ruled the world first. 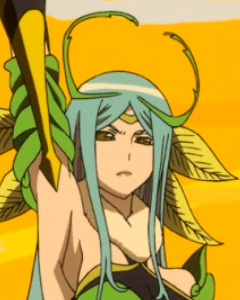 The Professor theorized that the Tartaros Bugmen were the descendants of the first ruling insects who, after evolving, left for another world. The story jumps into the future, the future where Jirou has left the Superhuman Bureau. Fuurouta’s facing a queen riding a giant bug. She tells him she’s finally grown enough to fight him. He has no idea what she’s talking about. As she hurls a javelin at him, Jirou blasts it with a firebolt from his bandaged arm. The blast knocks the huge bug down. As the queen tumbled to the ground, her mask came off, and Fuurouta saw that she was an adult version of Campe, the young woman he had met before. The narrative dives back into the past (or the present?). The Superhuman Bureau wants to negotiate with the Bugmen before resorting to violence. Anxious to prove his worth so he can join the Bureau, Fuurouta takes the virus weapon and heads for the National Diet. He enters the Black Fog and immediately runs into his glowing bug friend. He plunges her into his pocket to save her and detonates the weapon. It kills all of the Bugmen. The National Diet and politicians are saved! Back in the future, Campe explains why she now wants to kill Fuurouta: she’s queen of the Bugmen, and his bomb killed all of her people. She’s now the last of the Tartaros Bugmen. The Black Fog at the beginning of the episode had come to save her from the humans; Fuurouta just happened to set her free as they arrived. The Black Fog had attacked the National Diet because the politicians had decided to renege on their agreement to let the Bugmen roam the wild forests of Japan. 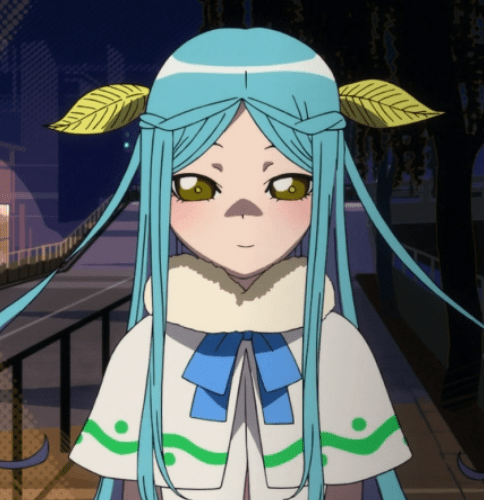 From Campe’s perspective, Fuurouta had promised to be her friend just before slaughtering all of her people. It was hard seeing Fuurouta so broken up. Capture from the Funimation stream. In the last scene, we return to the past (present? I’ve kind of lost track). The Superhuman Bureau admits Fuurouta to their ranks. Jirou cast the deciding vote. Why? Because he believed the ghost would fight evil and protect good superhumans. Jirou intended to rely on that attitude to help him remember the cause. Despite Ullr’s protests, Kikko used her magic to make breakfast. She argues that no one can see her, so why not? Ullr seemed to acquiesce by asking her to magically turn on the television so he could watch the news. Kikko’s magical powers can cook, too! 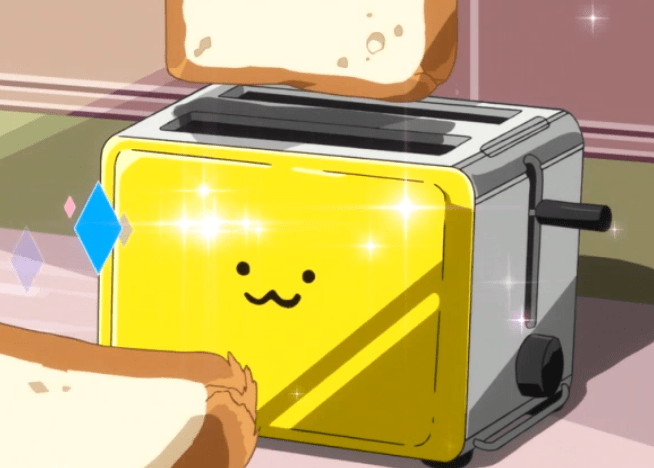 The toaster looks so happy! Capture from the Funimation stream. The background art continues to be absorbing. As with any new style, it took me a while to get used to it. Now, it feels familiar and adds to the visual “flavor” of the show. Animation continues to be colorful, vivid, and engrossing. The colors are so rich that at times I can almost feel them. This episode revealed some more of the world’s underlying logic. Just before they found that Superhumans had been injured protecting the National Diet, Jirou mused that if the Bugmen were evil, they had to have a superhuman counterpart. “Yes, those are the rules,” Emi says. I wonder if the series will delve more deeply into that mechanism? Emi said that remembered the Bugmen from “ages ago.” Who is she? She looks young to have memories stretching back that far! Was she recalling something she had read? Or was she recalling something she had personally witnessed? Speaking of Emi, she and Jirou seem to be romantically involved. That’s going to foster an interesting dynamic with Kikko! Emi remembered the Bugmen? She’s also romantically involved with Jirou. Capture from the Funimation stream. In the same way I enjoyed reading one of Shakespeare’s tragedies, I enjoyed the juxtaposition of Fuurouta trying to be helpful on one hand and thoughtlessly (and accidentally) careless on the other. He killed an entire race just because he wanted to impress Kikko and the Burearu. I was impressed that once he learrealned what he had done, he was ready to take responsibility. Still, this was pretty heavy and dramatic stuff for a second episode. I wonder if I saw a continuity issue? Fuurouta tried to hit on Kikko, and when she lost her temper that magically hurled all sorts of stuff at him, a broom hit Fuurouta on the head. But earlier in the episode, he could easily pass through inanimate objects! The books and other objects Kikko throws at him later in the episode appear to hurt, too. Could Campe really have killed Fuurouta? He’s a ghost, right? Or can he will himself to interact with inanimate matter? That would explain the broom and books. Campe grew up to become a powerful and tragic queen. Capture from the Funimation stream. I’ve watched some anime shows that I thought were great — and that didn’t reach this level of thematic complexity until the last episode. This episode traced the horror an innocent concept of good and evil can unleash in the world. Fuurouta had no malicious intent. He seemed to genuinely want to be Campe’s friend. But his tunnel vision caused destroyed her entire race and left her alone. In my last Concrete Revolutio review, I wondered if Concrete Revolutio was going to try something great. With this level of tragedy, I’m seeing more indications that it is! The narrative seemed to draw a parallel between the ghost and Jirou in terms of their initial idealism. Jirou’s attitude in the “present” seems strained, as he he’s struggling to hold onto his own simple sense of right and wrong. He even votes to admit Fuurouta in the hopes the ghost will bolster his spirits! Yet in the end, Fuurouta is broken hearted and lamenting his naivete to Jirou, even to the point of asking why they were enemies. Jirou’s hope had failed; now, Fuurouta’s had gone the same route. This kind of drama, where events push characters beyond their limits, is something I treasure. I’m really looking forward to seeing what drove Jirou out of the Bureau. And, I hope, to seeing what redeems him. I hate to say it because I’m afraid of being disappointed, but Concrete Revolutio has pushed my expectations pretty high. The Asterisk War Episode 9: The Festa Begins! D.Gray-Man (HALLOW) Episode 105 (a.k.a. Episode 2): Battleground Orphanage and the Enemy Evolves! 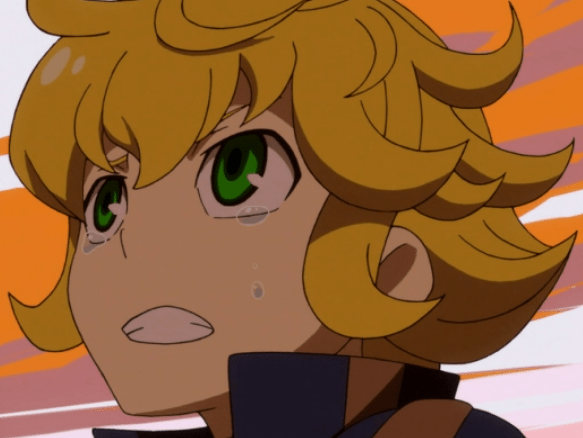 Concrete Revolutio Episode 1: Nope, Not Kansas Anymore! The Asterisk War Episode 3: So That’s Why Julis Fights.